La Trinité and Place d'Estienne d'Orves. Designed by Théodore Ballu, La Trinité, tower of which is in foreground, was completed in 1867 and is located at the Place d'Estienne d'Orves in the 9th arrondissement in northern Paris near Montmartre. All photography: ©Brian Jannsen Photography. Unauthorized use is prohibited. "Paris is always a good idea." Audrey Hepburn as Sabrina Fairchild in "Sabrina"
By day or by night, Paris truly is the City of Light but at twilight, something magical happens—the fading light of the day reveals an ethereal beauty, fleeting moments of poetic expression onto the magnificent canvas of iconic landmarks, Parisian cafés and quaint cobblestone ways. 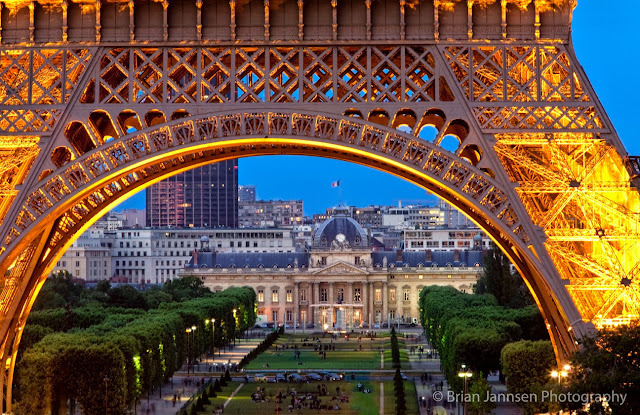 Once again, I am thrilled to be working the master of light and lens himself, Brian Jannsen who captures the visual romance of Paris with such exquisite artistry that it takes your breath away literally! Join me this unforgettable guided tour through Paris—from the rive droite and rive gauche (right and left banks) and whether you walk, hop onto the metro or hire a car with SmartShopping.com, you'll never look at Paris the same way again. Finally, be sure to read more about Brian at the end of this article. For now, bienvenue à Paris. We begin our twilight walk at the most famous of all Parisian landmarks—the Eiffel Tower. Then, we'll stroll along the River Seine's left bank and cross over to the right alongside the Louvre, through the Place de la Concorde, onto the Arc de Triomphe and conclude our tour high above it all in Montmartre. 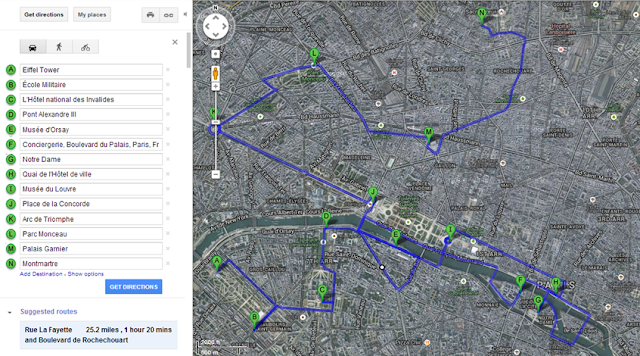 Click on photo to see enlarged view of the "Twilight in Paris" Tour from the Eiffel Tower to Montmartre. Photo: Google Maps. The Eiffel Tower was designed and built for the 1889 Exposition Universelle and to commemorate the 100th anniversary of the French Revolution. 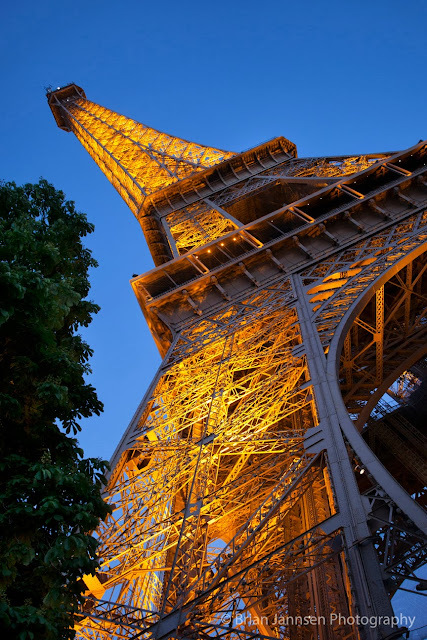 Designed by Gustave Eiffel for the 1889 Exposition Universelle and to commemorate the 100th anniversary of the French Revolution, the Eiffel Tower was built in just over two years. 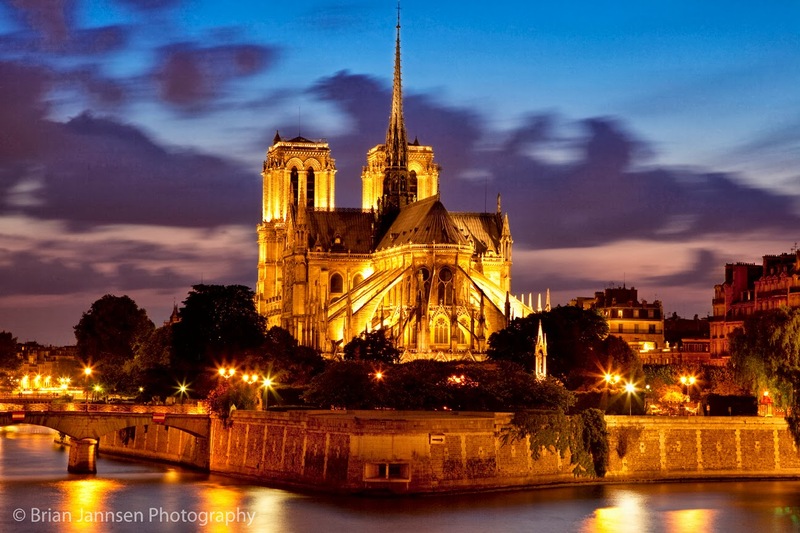 It has become the symbol of France and has inspired artists, photographers and writers alike for more than a century. But at twilight and into the night, this French icon transforms into something magical—illuminations— a dazzling array of dancing lights that becomes a beacon seen throughout the city. When I first saw this extraordinary light show from my hotel near the Louvre, I couldn't believe my eyes! It was remarkable! If you're planning to visit the Eiffel Tower, check out the official website with all the times and information you'll need to help you plan your ascent! This striking composition beautifully frames the Institut des Hautes Études de Défence Nationale et d'Economie de Guerre and the École Supérieure de Guerre, (Institute for Advanced Studies in National Defense and War Economics, and the Graduate War School) in the background. From the tower, we head south across Parc du Champ-de-Mars to the former military training complex École Militaire. Found by King Louis XV in 1750 as a school for young cadets, the École Militaire today houses the Institut des Hautes Études de Défence Nationale et d'Economie de Guerre and the École Supérieure de Guerre, (Institute for Advanced Studies in National Defense and War Economics, and the Graduate War School), among others and can only be visited by appointment. Did you know that in 1784 the school accepted a young officer by the name of Napoleon Bonaparte who graduated in one year versus two, the norm? The Pont Alexandre III with the L'Hôtel national des Invalides or Les Invalides in the background. Home to the Musée de l'Armée and Napoleon's Tomb inside the Église du Dôme, L'Hôtel national des Invalides or Les Invalides is easily recognized by its gilded dome towering above the nearby skyline. Built in 1671 by Louis XIV to house 6,000 disabled veterans, who at the time had to rely solely on the charity of religious institutions, Les Invalides was designed by Libéral Bruant (hôtel) and Jules Hardouin-Mansart (Église du Dôme), the latter inspired by the renowned Saint Peter's Basilica in Rome and remains one of the defining examples of French Baroque Architecture today. History buffs will love the Musée de l'Armee as they retrace the footsteps of military history chronicled from prehistoric times to the present. As long as you're in the area, swing by the far-less crowded Église St-Louis-des-Invalides to see another fine example of 17th-century religious architecture. To help you plan your visit, check out their official website. One of the most ornate bridges in all of Paris, the Pont Alexandre III was built for the 1900 Exposition Universelle. 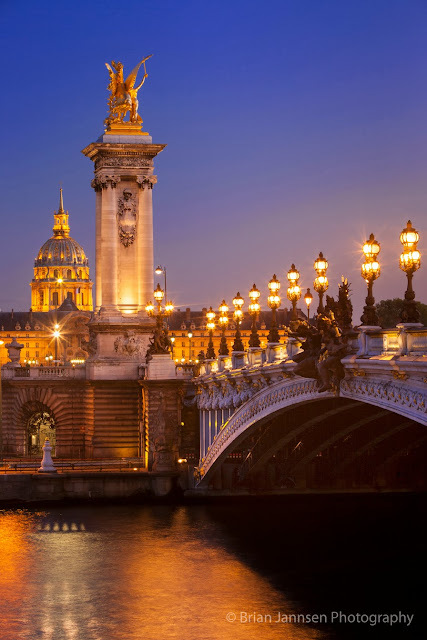 Regarded as the most ornate bridges in all of Paris, the Pont Alexandre III was built for the 1900 Exposition Universelle so that visitors could cross the Seine to see attractions on both sides of the river. One of the finest examples of Art Noveau architecture, the bridge is embellished with exquisite sculptures of cherubs and nymphs plus four towering pedestals topped by magnificent radiant gilt statues of Fames Restraining Pegasus (Fames of Sciences and Arts on the Right Bank and Industry and Commerce on the Left). The pont was designed by three architects and intended to integrate with the architectural styles of the Grand Palais and the Petit Palais on the other side. The first cornerstone was laid by Tsar Nicholas II as a symbol of the allegiance between the two nations and named for Nicholas' father, Tsar Alexandre III. As you cross over, look to your left to see the Trocadéro, another remnant of the 1900 Universal Exposition; and to your right, the Tuileries Gardens with the magnificent Louvre pyramid beyond. Formerly the Gare d'Orsay railway station, the Musée d'Orsay is the home to French Impressionism. After crossing over the Seine, head to the right and eventually to the quai des Tuileries. From there, you'll soon approach the magnificent Musée d'Orsay to your right just across the river. 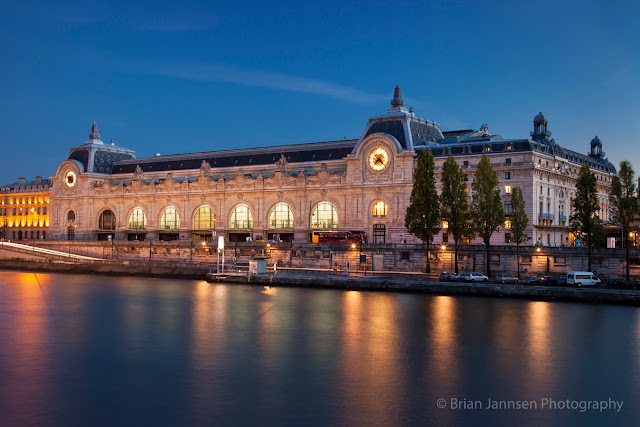 Undoubtedly, the Musée d'Orsay is the home to French Impressionism and inside this former railway station—the Gare d'Orsay; you'll find the most comprehensive collection of the Impressionists including Monet, Manet, Degas, van Gogh among many others. Originally built at the turn of the 19th century, the building nearly met its doom in the 1970s when the French realized, thankfully, that the building could house the various collections of 19th-century art in one location. Visit the Musée d'Orsay website for information on collections, exhibitions and operating hours. The Conciergerie was once a royal palace and prison and now part of the much larger Palais de Justice. Moving our way along the Seine to the Île de la Cité, the medieval Conciergerie comes into view. This one-time royal palace and prison is part of the much larger Palais de Justice which rests upon the site of the former royal palace of Louis IX or Saint Louis—Palais de la Cité. And sadly, was the place where Marie Antoinette eventually met her fate. Dating back to the Middle Ages, three towers remain from the king's concierge who managed the palace after Charles V abandoned it during the mid-14th century: the Caesar Tower, named after Rome's mighty rulers; the Silver Tower which is believed to have housed the royal treasure at one time; and finally the Bonbec Tower (good beak) which served as a torture chamber where prisoners were forced to sing. 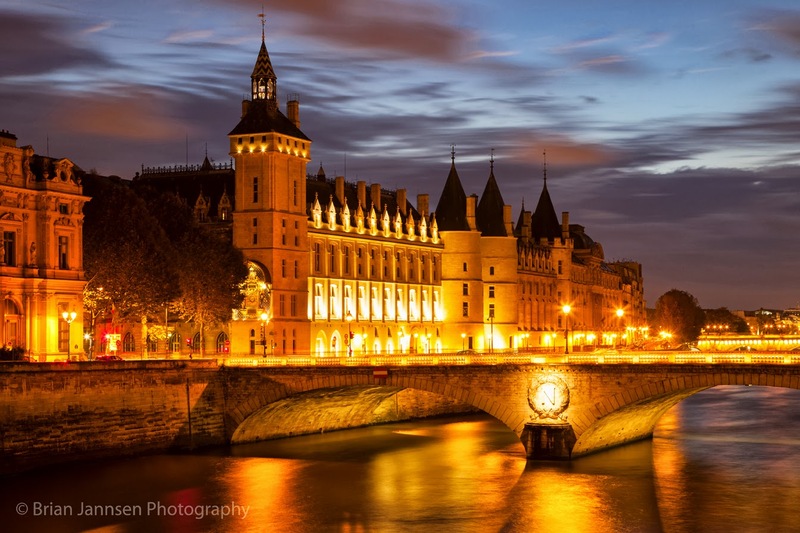 Decommissioned in 1914, the Conciergerie is open to the public today and listed as a historical monument. Steeped in the history and literature of Paris, Notre Dame, "Our Lady of Paris," Cathedral is a must see on all Parisian itineraries. Standing for 1,000 years, the cathedral took nearly 200 years to complete from the time the first stone was laid in 1163 during the Gothic movement, to 1345 when the final phases were completed. After you tour this Paris landmark, climb up its 387 steps to the top of the South Bell Tower for awe-struck views of Paris and the River Seine. The entrance is located just to the left of the Notre Dame's western portal. Visit NotreDamedeParis.fr for more information about services, hours of operation and the night shows. 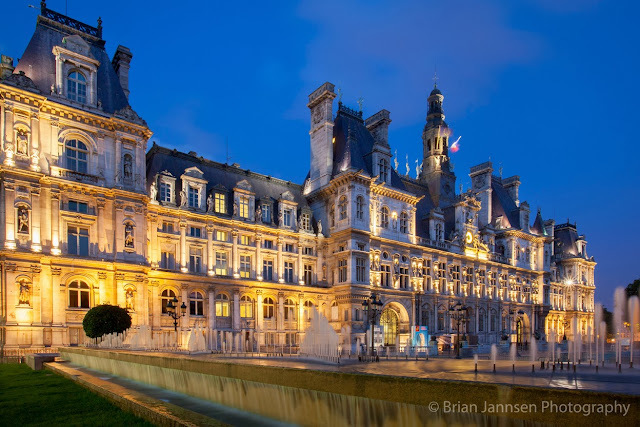 The magnificent Hôtel de Ville stands upon the ground that has been site of Paris' municipality since 1357. After leaving Notre Dame, continue to Pont d'Arcole and make a right onto quai de Hôtel de Ville. Continue one half block and look to your left. Not really a hotel at all, the Hôtel de Ville is the seat of Paris' municipality including the office of the mayor and the city council. Actually, this very location has been the site of the municipality of Paris since 1357. Dating back to 1628, this Neo-Renaissance edifice was rebuilt from the outside post the Commune of Paris fire that devastated the entire building save a stone shell in 1871. Reconstruction began in 1873 and the building we see today opened its doors in 1892. Located in the recesses of the façade are 107 sculptures representing historical figures, the Abstract Virtues (Hope, Faith and Charity), French towns and famous Parisians! There is no admission charge to enter. 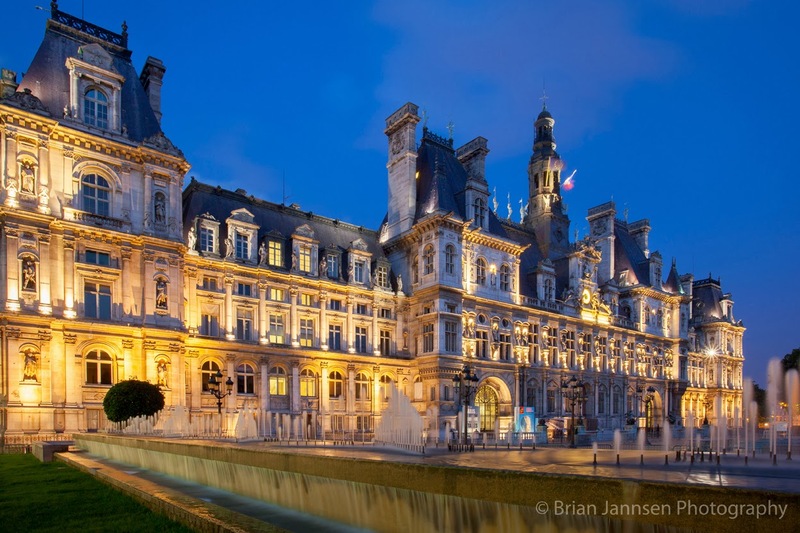 Visit Paris.fr for more information on the Hôtel de Ville. The unmistakable I.M. 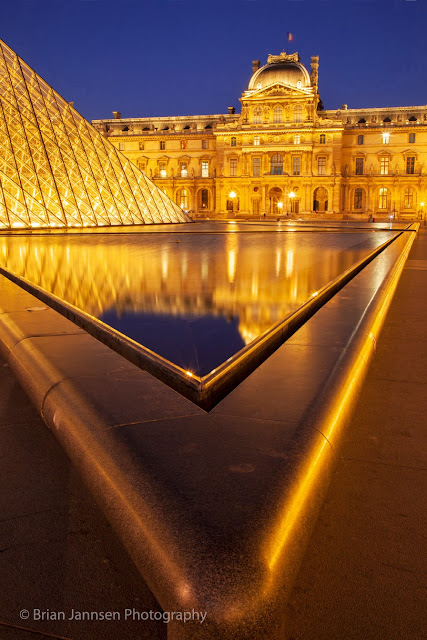 Pei Louvre pyramid provides a striking contrast to the Renaissance palace facades. Make your way to quai along the River Seine and follow west to the Musée du Louvre. The juxtaposition of the modern and the Renaissance is undoubtedly unnerving to some, but the Musée du Louvre provides for a stunning backdrop in any photograph. This unique perspective highlights the triangulation of the designs of the foundtain and the glass pyramid. The overall façade is an exquisite blending of architecture—Ieoh Ming Pei meets Catherine de Medici! Inside the largest museum in western civilization, you can journey back to the age of antiquities and forward to 1850. After that, it's the Musée d'Orsay for the Impressionists. Visit the Musée du Louvre's official site for collections, exhibitions and times and information. 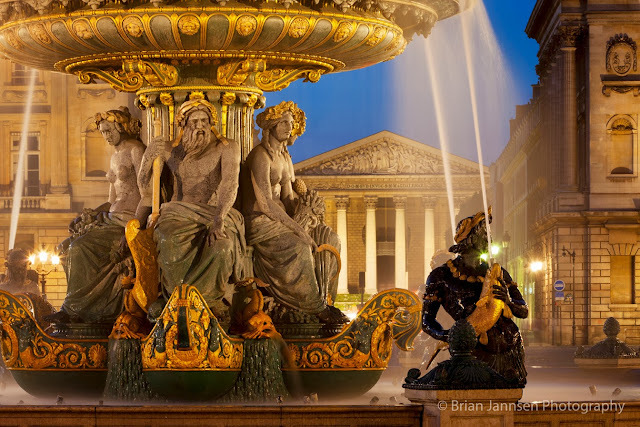 The "Fountain of the Rivers," pictured above, features figures representing the Rhône and Rhine rivers of Europe. From the Louvre, meander through the Tuileries Gardens and head to the Place de la Concorde, you can't miss it, just head to the obelisk. Bookending the Luxor Obelisk from 14th-century B.C. in Egypt, Fontaine des Fleuves add a striking feature to this composition in the Place de la Concorde. Designed by Jacques Ignace Hittorff and completed in 1840, the south fountain commemorates the maritime industry while its opposite commemorates navigation of France's rivers. The Maritime Fountain is decorated by figures representing the Mediterranean and Atlantic while the northern Fountain of the Rivers, pictured above, features figures representing the Rhône and Rhine rivers of Europe. The Arc de Triomphe commemorates the lost souls of the French Revolution and is the site of the Tomb of the Unknown Soldier from WWI. After visiting the Place de la Concorde, follow Av Champs Elysees to the Arc de Triomphe directly in front of you. 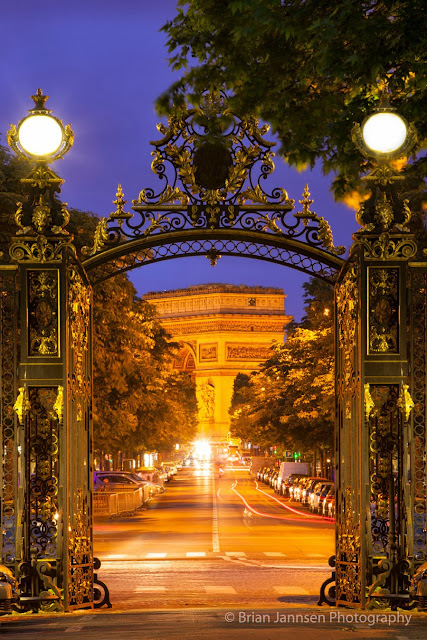 One of the defining icons of this City of Light, the Arc de Triomphe rises from the Place Charles de Gaulle (originally Place de l'Étoile). Commemorating the lost souls of the French Revolution and the Napoleonic wars in the 17th and 18th centuries, this magnificent monument graces the Tomb of the Unknown Soldier from WWI. Its colossal size leaves you awe-struck as you approach its base especially when compared to its inspiration—the Arch of Titus in the Roman Forum. 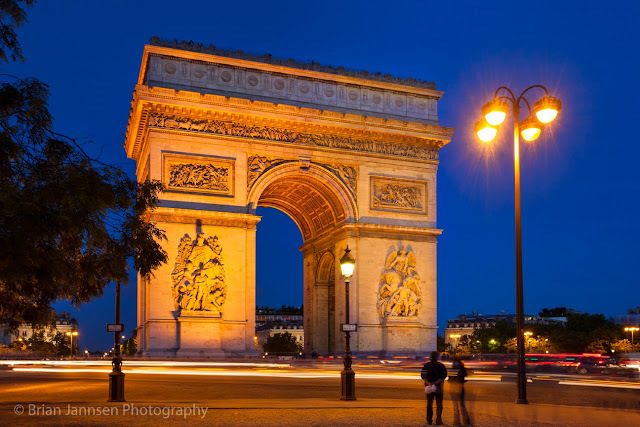 Commissioned by Napoleon in 1806, the Arc de Triomphe was completed 30 years later in 1836. Find out more. The Parc Monceau features more of a traditional English garden than it did when it first opened. When your visit to the monument concludes, find Av Hoche and follow directly into the Parc Monceau. When the park was completed in 1779, the Parc Monceau captured the very best of Europe with its Roman colonnade, statuary, water-lily pond and enchanted grotto, a windmill, a Roman temple of Mars, an Italian vineyard and even featured a miniature Egyptian pyramid. In 1787, Thomas Blaikie transformed the garden into a more traditional English garden that included the Pavilion of Chartres. The exquisite facade of the Palais Garnier or Paris Opera House. You may need to get out your maps at this point because there are a couple of streets you'll need to meander down before you reach the Palais Garnier. Follow Boulevard Malesherbes for approximately six blocks until you find Rue Mathurin and make a left. Continue on Rue Mathurin for another six blocks and you're there! 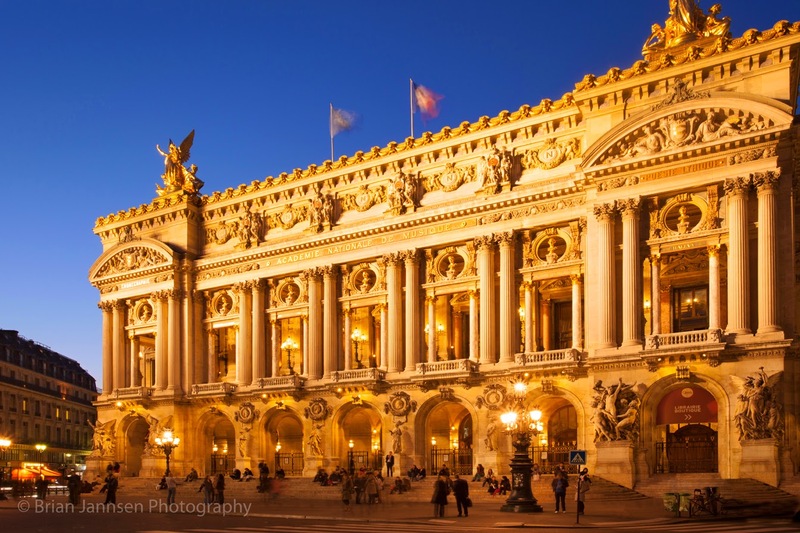 One of the most striking buildings in all of Paris, the Palais Garnier is rich in its exterior appointments from the exquisite golden statuary, the Corinthian columns and the magnificent arcade of arches and windows at its base. 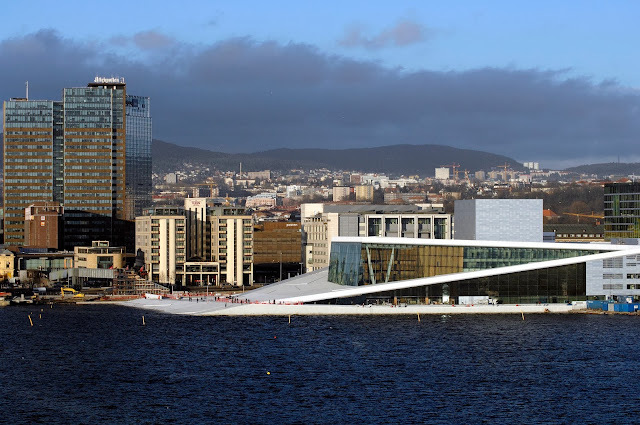 Built at request of Napoleon III, construction on the opera house began in 1861 and opened in 1875 after interruptions due to the Franco-Prussian War and the Commune. Of the 172 architects who competed for the commission, it was a 35-year-old unknown Charles Garnier who won the commission and designed one of Paris' most beautiful buildings. And if you think the outside is remarkable, the lavish interiors will leave you awe-struck, especially the onyx and marble-embellished Grand Staircase! For more information on the Palais Garnier and incredible virtual tours through the entire building, check out www.OperadeParis.fr/en/L. La Trinité church in the foreground with Sacré Coeur rising. 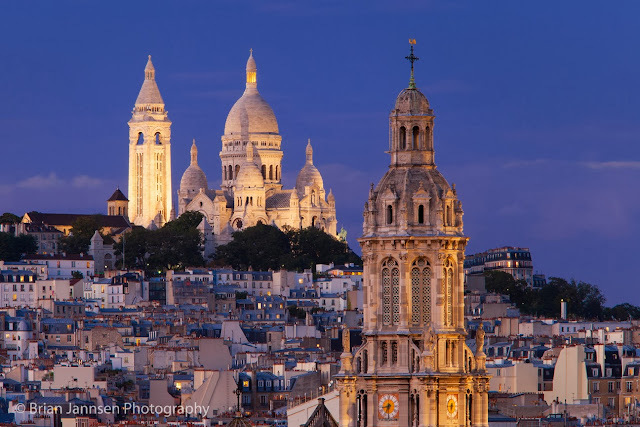 Translated as "Mount of Martyrs," Montmartre is the Parisian hillside or "butte" as you'll see it written in a few guidebooks, where Paris' patron saint, Saint-Denis was beheaded and according Catholic faith, carried his head north to the site where Saint-Denis Basilica stands today. 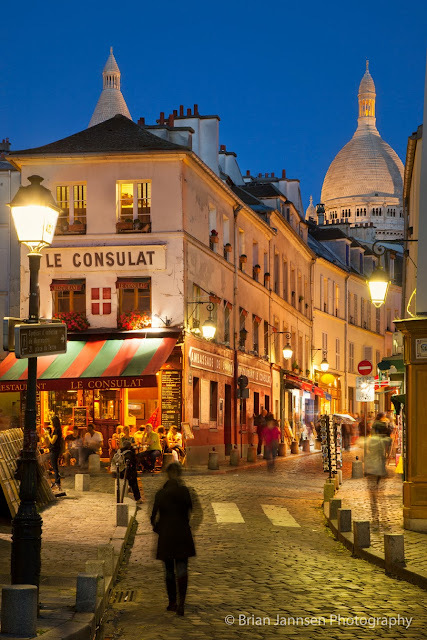 A walking tour through Montmartre should be on every Parisian itinerary—not only for the quaint neighborhoods and cobblestone streets, but this place is the stuff of legends—the place where aspiring artists converged to live, play and create … from Hemingway and Picasso to Edith Piaf and Henri de Toulouse-Lautrec who was reputed to be seen every night at the Moulin Rouge sketching his cancan girls as they performed at the turn of the last century. 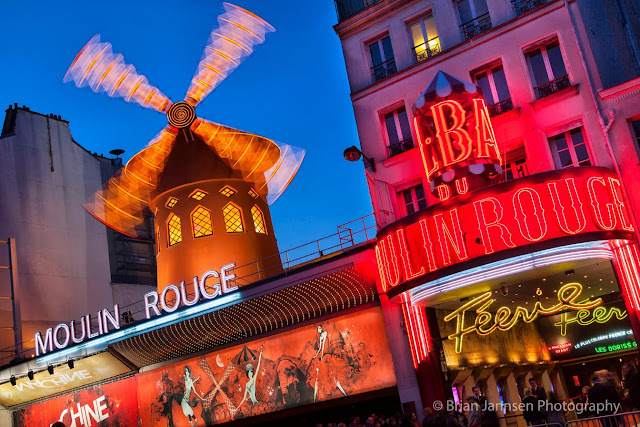 Another must-see attraction on every Parisian itinerary—Moulin Rouge. Rising high above the village of Montmartre is the impressive Sacré Coeur Basilica with its striking white gypsum exterior and the exquisite sculptures, mosaics and stained-glass windows on the interior. Although it looks to have been standing here for centuries, Sacré Coeur is relatively new and was completed in 1919, 44 years after construction began following interruptions of the Franco-Prussian War and the Commune, a similar fate suffered by the Palais Garnier as I mentioned above. Below is one of my favorite shots in this series—Rue Norvins—one of Paris' most picturesque neighborhoods left untouched by the wars. Romantic as ever with its narrow 17th-century streets and architecture, this view along Rue Norvins is looking east toward Sacré Coeur. Be sure to drop into the Boulangerie Patisserie for a little Parisian confectionery indulgence. 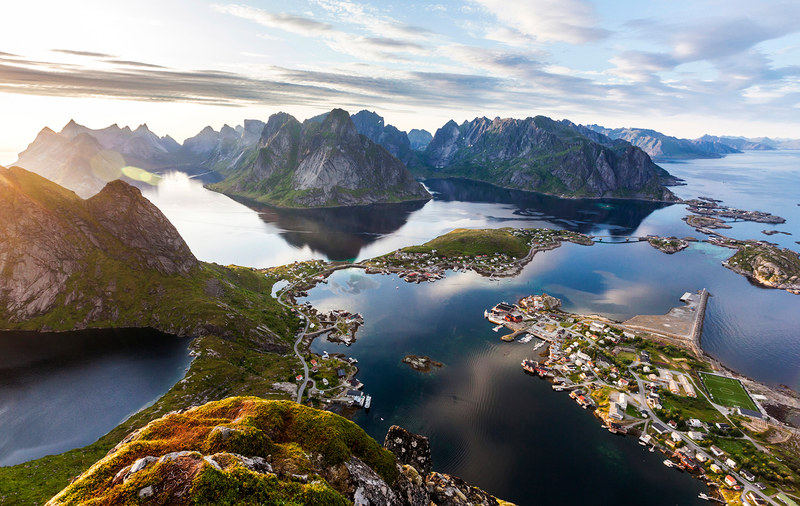 Visit 360Cities.net for an amazing virtual tour. One of Paris' most picturesque neighborhoods can be explored via rue Norvins. For now, this marks the end of our journey through Paris. I hope you enjoyed this grand tour of the City of Light, with visual romance credit to my friend Brian Jannsen. Brian, where are we going to next? The interesting and compelling narrative and gorgeous photos have me craving a return visit to Paris. I have not spent nearly enough time there -- is there even such a thing as that? I can just picture myself strolling through Montmartre! Hi there Cathy and thank you so much for stopping by and for your kind compliments!! I too have not spent nearly enough time in Paris and am craving a return visit especially after writing this article! I can't wait to visit Montmartre one day soon ... perhaps with you!! Dream-worthy theme, Jeff! I really enjoyed this 'evening in Paris'. Hi there Lesley and thank you so much for your kind words! Brian has a way of transforming anything in front of his lens--it's truly magic! Thanks for stopping by my friend. Hey Jeff... Once again you've written a masterpiece - it's an honor to be part of it. Great research and info here - so nicely done! Maybe next we go on a tour of those hidden treasures in Paris that most tourists never quite get to see!! Congrats though on this post - you've done yourself proud! Brian, it is I who is honored to feature your impressions of Paris!! I can't thank you enough for your partnership, you bring magic into this world and I am grateful to be a part of it!!! Thank you for all of your kind words too! Where to next my friend? Oh, these pictures make me so homesick for the city that was home to us for 20 years. It is undeniably very pretty at night. Hi there Marlys!! I knew you would love this post. Thanks so much for stopping by and sharing your thoughts! I could spend the day looking at pictures of Paris - these are beautiful! Hi there Lisa!! I couldn't agree with you more. I wish I could step into one of these images and wander through Paris for a month or so! Thanks you so much for stopping by and sharing your kind compliments! What a beautiful composition of photographs and narrative. It stirs the heart and makes one yearn to be in this magical city. For now content in living vicariously through your pen and lens even for just a moment. Merci beaucoup! Hi there Marissa and thank so much for stopping by! I am honored by your compliments and I will be sure to pass them onto Brian who is responsible for all of the IMAGES in this post. 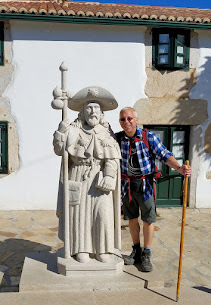 It's funny that you wrote "pen and lens" as my branding message at the top of my blog used to read "European impressions brought to life through the power of lens and and pen." Great minds I guess. ; ) Thank you again! Hi there and thank you so much for stopping by and for your kind compliments. I will be sure to pass them onto Brian. I've tried driving in Paris (desperately trying to find a parking space) so I think I would choose the metro for sightseeing. I hear you loud and clear and I would opt for walking as much as possible and hopping on the metro when and if needed, especially to Montmartre. Thank you for stopping by and sharing your tips!! Hi there my friend and thanks so much for stopping by and for your kind compliments! 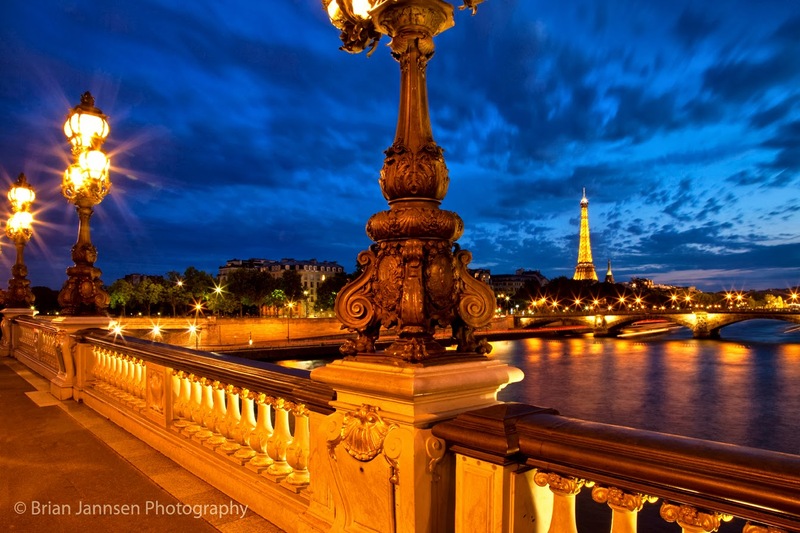 We LOVE Paris at night! It truly is the city of lights and there is nothing better than a stroll through the town at night. These are some great pictures! Hi there Evan and thank you so much for stopping by!! I can't agree more with you my friend! Brian is truly a genius! Feel like I just spent a month in Paris....and I don't want it to end! Such lovely photos....compelling me to stay. Is it even possible for there to be a more romantic city than Paris? I think not!! Hi Susan! I LOVE LOVE LOVE Paris and agree that there isn't a more lovely city on Earth!! Thank you so much for stopping by! These are gorgeous photos! Really enjoyed your blog! Thank you for all of your kind compliments.